Due to previous engagements, I was unable to attend any of the performances of this production but the Directors very kindly agreed for me to attend the dress rehearsal instead (19 June 2014). I am very pleased that they did, as the show was most enjoyable. This was a relatively young cast and, with a few exceptions, also relatively inexperienced. However the entire cast put their hearts and souls into their performance and were, obviously, enjoying every minute. Jess Culverwell played Dorothy with great style and energy, her singing was excellent in the lower register although she was a bit tentative singing the higher notes. She was hitting the notes spot on, but was holding back which made an obvious contrast mid song. Jared Bates was an excellent Lion with great characterisation and stage presence. Megan Greenwood played the Tin Man and she brought just the right amount of character to the part. Grant Clark was the perfect Scarecrow, his movements were extremely good, giving a great impression of loose limbed movement. All three have good singing voices and delivered their songs with confidence. Georgia Bennet played the good witch (The Sorceress) with good diction and stage presence and she looked beautiful. Isabella Abraham played the Wicked Witch of the West and was suitably evil! Peter Angeli and James Ravenscroft (sharing the role of the Wizard) completed the cast of Principals. The ensemble worked very hard playing all the different characters and they all spoke out well and behaved impeccably on stage. Because it was the dress rehearsal there was, inevitably, the odd moment when scenery was being moved as the cast were performing. To their credit, this did not faze them at all, they carried on as though nothing was happening, truly professional! The scenery was excellent, well presented and appropriate. Costumes were really good, with some good coordinating colours etc. The microphones were not always turned up on time but this is completely forgivable in a dress rehearsal and it was beginning to be sorted in the second half so I am sure it was all OK for the actual performances. Overall a lovely production with a strong cast. It was lovely to see so many younger performers; hopefully they will continue and build on this experience. 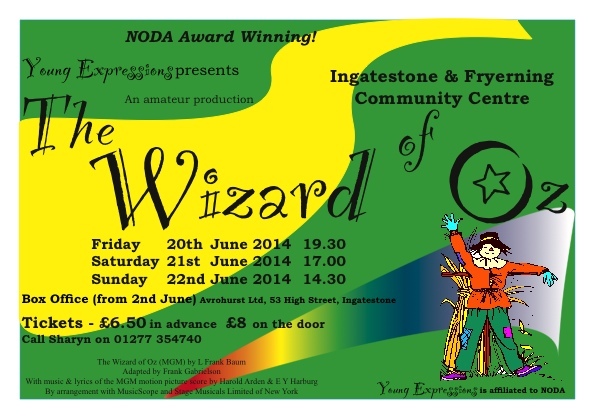 Well done Young Expressions, I am looking forward to seeing the pantomime.